These pumps are suited for both portable and stationary applications. The design of the GNX and GNXH Series pumps eliminates traditional couplings and features a single-stage gearbox with aluminum housings, NEMA C-face or IEC D-flange motor connections and a proprietary output shaft that is compatible with the Blackmer keyed pump shaft. This design makes GNX and GNXH Series pumps the industry’s first alignment-free, reduced-speed pumps for use in both portable and stationary applications. 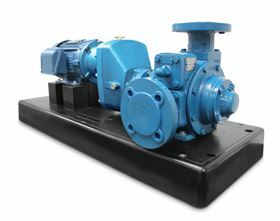 Blackmer claims that the pumps’ gear reducer is capable of producing low ratios, resulting in more precise flow rates. Also, the locked-rotor between-bearing design could extend mechanical seal life and improve operational safety. The compact footprint uses a close-coupled, inline design that allows the pumps to be a like-for-like replacement in existing systems. Blackmer launches its GNX and GNXH series of sliding vane pumps.